What I didn’t mention, because I don’t usually reveal travel plans in advance, was that I had to drive to Boston on Monday, so that whole being-on-time thing was important. Well, WordPress was on time. Delta? Delta had some issues. 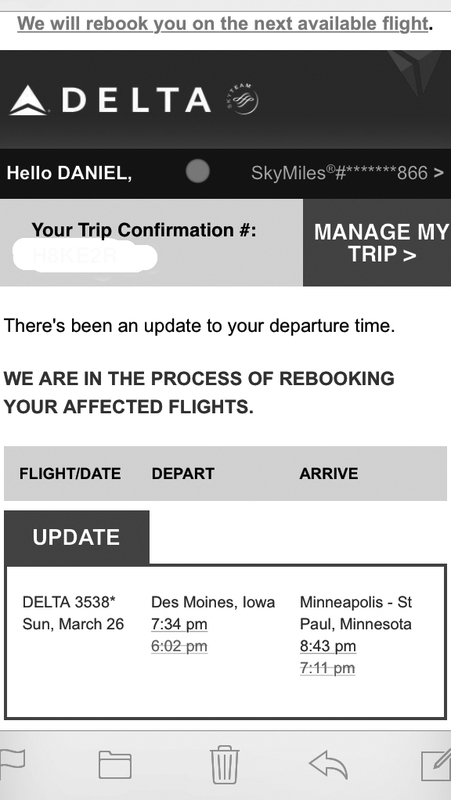 At about 2:30 pm, Delta notified me that my 6:00 pm flight from Des Moines (DSM) that was to connect me to my 8:00 pm flight from Minneapolis-St. Paul (MSP) to Hartford (BDL), wasn’t going to leave DSM until 7:34 pm. It’s a short hop, but not that short. It was almost 3:00 pm. We still had to stop to see my mom – couldn’t leave Iowa without giving her a hug – and she lives 15 minutes in the opposite direction of MSP, and getting there for an 8:00 flight means 6:30-ish. We stepped into high gear. My niece packed up my mom’s dinner. I packed up my electronic gizmos, my brother looked for some good driving music – hey, some things are important – and we were off. A Delta representative called me as we were pulling into my mom’s apartment building’s parking lot. The representative worked the issue offline while I said goodbye to my mom (universal understanding of that requirement) and by the time I was back in my brother’s car, she confirmed the fact that our plan was our best option. Iowa-Brother-Airlines was cleared for take-off. Flying Driving Flying-low time to MSP, just under three hours. Note: if you ever find yourself in the situation where you are going to miss the first leg of a multi-city flight, you NEED to speak with a representative. Mine kept me on the line for about 20 minutes while she worked to make sure that my seat on the flight from MSP-to-BDL wasn’t going to be put back on the open market after I didn’t board the DSM-to-MSP flight. For the second time in two weeks, I was at Gate-D3 in MSP, waiting for an 8:00 flight to Hartford. My brother stopped for dinner on his drive home. Ironically, he texted me that he arrived home, a few seconds after we touched down at BDL. Sometimes, people step up when most needed – Thanks Bro! This post is part of Linda G. Hill’s fun and challenging weekly series One-Liner Wednesday. Challenging because I can’t seem to stick to one line. The gallery includes some of the pictures I took as we drove through the rain to MSP. I managed to get some interesting doors-at-a-distance shots, but I’ll save them for a few weeks. A lot of these big empty fields had a lone bare tree standing in the middle. Birds! This huge swarm of birds flew across the highway, spread out and filled these trees. The scale of these farms is just amazing. I’m not sure what’s going on in the center, but it’s pretty cool. OK, that car is going really, really slow. So slow. Slowest car ever. We are not speeding. A crane building a windmill. Yeah, who didn’t know I’d be taking a picture of that? This looks like something I’d expect to see in a Star Trek episode. I’m pretty sure spaceship-smashing beams come out of the top. No, we did NOT stop. Owantonna Regional Airport. Not my destination but I wouldn’t mind flying home in one of those. My east coast friends might snicker, but that’s a ski area. It’s like when Dorothy and the crew saw OZ. Thanks Robin. I couldn’t stop taking pictures. I never see farms this large, and I realize I was only seeing a small portion of the farm. I’m wondering if the airport was a former Air Guard base. (1) Your brother is the BEST! Not only did he drive you 3 hours to catch your connecting flight, but he did so in the rain?! You have a winner there! Can I reiterate what Joanne said in (1). Your brother has a good heart and soul. Your mom raised two fine young men. In regard to the photos, they all made me smile or laugh to some degree. You get 20 points added to your license for not being in the black SUV, 50 points for *ahem* not speeding *ahem* while passing the sloooow car, and 500 points for the Star Trek barn. Congrats, Dan. Outstanding entrance to the Owantonna Airport!! Some people really do step up when you need them the most, don’t they?! I mentioned earlier, I want to check to see if that airport was a former Guard Base. In any case, I love the entrance. We only had a few minutes to decide what to do, and there was no question as to his willingness. The regulatory overkill has been going on for years. California is now regulating itself to death and has the 2nd highest unemployment t rate in the country (12% last I checked) and is as high as 30-40% in some areas. Despite a desperate need of tax revenues to pay off overgenerous pension benefits, they still don’t get it. If one of the financially worst-off states in the country do#1s&e82n7;t get it, what chance do we have with the Feds who can just print money to pay off their debts. Apparently, some people DO need a ton of bricks to fall on them. Travel is getting more and more unpredictable, Judy. I didn’t even realize that I had a Plan-B this time. I felt bad that he and I arrived home at the same time. This travel mini-marathon ends today, as I head back to Hartford for a while. Thanks. The farms out there are so big, they do seem to just go on and on. Although I’v been to the West, North East and deep South…:-) I think my next visit will be towards that area! Totally agree about your brother being the BEST! Whew! That is some kind of driving! And photos, too! Thanks Lois. I’m hoping he gets to read some of the comments. He doesn’t mind driving, but it was raining, and he had to drive back alone. And, he’s been looking at mid-west farms for almost 50 years, so I don’t think the scenery was helping to keep him awake. Good teamwork, all! Glad it all worked out, Dan. Thanks Paul. I’m finally home for a while. I just got back from Boston. That’s what brothers are for… It is what we do for each other. You passed through my home turf. We live about ten miles east of I-35 just north of I-90. I recognize the casino and the jets at the Owatonna airport. Too bad you didn’t come through yesterday, spring arrived with sunshine and temps in the mid-50’s. Good on your brother! Very nice! Your pictures look a lot like ‘home’ to me, especially the one evocative to you of ‘farm’. It’s flatter there, but the buildings are the same. Thank you for the answers! It was a fun ride. I would have preferred clear skies and sun, but he drove through the rain pretty well. I’m assuming that was a drive up I-35? Been on that route many times over the years!! Great reminder that your ticket is negated by missing the first leg of a flight that has connections…great ending that Delta worked with you!! You got it Kirt. Straight up I-35. The Delta agent was very good. She kept me on the line while she got a supervisor to keep that second leg open. I never would have thought of that. Nobody likes delays, but when it works out well, you breath a big sigh of relief. Exactly!!! Glad you are home and all worked out well!! Love those offers to help. What a brother. I know right? My brother would saw aw gee and drive me to a motel. I have two brothers and both of them would step up to the plate if needed. I’m glad Delta worked well for you. They are still of my s*#@ list for cancelling our seats out of Montreal, even though we got to the gate in time. I can understand being upset. I enforced a 12-month ban on Southwest after they messed with me. It was actually 14 months after the incident before I booked another flight with them. Delta gets a few bonus points for me, because they got me home the day Southwest left me to rot in Salt Lake City. ^5! To your brother for having your 6! Delta sounds like they get some bonus points for taking care of your flights and getting you onboard another flight(s). The images. SILOS!!! I love them, and the lone tree in the field. I wish we had more of those. That rustic barn would be a neat place to explore and photograph. I wish I had time to stop and explore, even from the side of the road. I love the silos. I’ve never been up this highway before. Much more to look at than west to Omaha. Thanks for the comments on the photos. Looks a lot like Nebraska, Dan. Glad you had a chance to take some pictures on your journey. Iowa, Nebraska, Kansas, Minnesota…you guys all do kinda look alike :) But, coming from the east, where towns are stacked on top of towns, it’s amazing to see wide open spaces. Aw…sorry. I fly other airlines, but when things go to heck in a hand-basket, Delta seems to have a leg up on the others. Maybe they have more problems and had more practice, but twice now, Delta has been there to get me home after Southwest dropped the ball and twice that I’ve had problems on Delta, they have been no big deal. Dan, that water tower/casino sign combo was fun viewing. You don’t see that everyday in PA either. We indeed have both…but have managed to somehow keep them separate. You have plenty of farmland there too, but it has hills. The endless fields are amazing to me. Great images. What is the maximum number of places you’ve visited in one single trip? During my college days I went for a 3-day trip to Konkan which is just 500 kms south of Mumbai. I visited 25 places in those 3 days. You remember that old photo of mine outside the Pepsi factory that Pepsi factory was one of the stops. I’ll have to think about that and get back to you. I think it’s the trip my daughter and I made to Pittsburgh in 2012 but I need to count. Thanks Linda. I was lucky he had enough time and was willing to make that trip. That is fantastic that you were able to take the low flying airlines. Only a true friend would drive 6 hours for you, but I guess it’s in the blood. I also take pictures from. The car, how else would you remember what you’ve seen? I liked the comments as much as the pictures.